Today I want to write about a majestic bird that I have seen soaring high in the sky not far from where I live. It’s the wedge-tailed eagle. They are the largest bird of prey in Australia and the fifth largest eagle in the world with a massive wingspan of up to 2.3 metres. Females are usually slightly larger and heavier than males. They build massive nests in very high trees out of dead sticks. These nests can be up to 2 metres wide, 3-4 metres high and weigh up to 400 kg. They lay 1-3 eggs. Young wedge-tailed eagles are a light brown colour and get darker each year until they are almost black by the age of 10. A large part of their diet is made up of rabbits and carrion, especially roadkill. They also eat wallabies, large lizards and snakes, dogs, cats, possums, goats and lambs. Groups of wedge-tailed eagles have also been seen hunting kangaroos as a group. Australian farmers used to shoot and poison these beautiful eagles because they thought that they were a threat to their lambs. Killing them is now banned and they are found throughout Australia, including Tasmania, and in southern New Guinea. 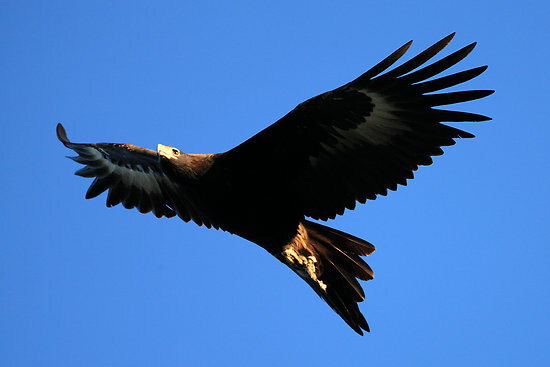 Are there any other interesting facts that you would like to share about wedge-tailed eagles? Oops, my bad. Only the newly hatchlings are white the young ones as you’ve said are light brown. Sorry. Darren: I am a Canadian children’s writer. I had a wonderful opportunity to be photographed with a wedge tailed eagle at the Curribim Wildlife Sanctuary in Queensland. What an incredible bird.